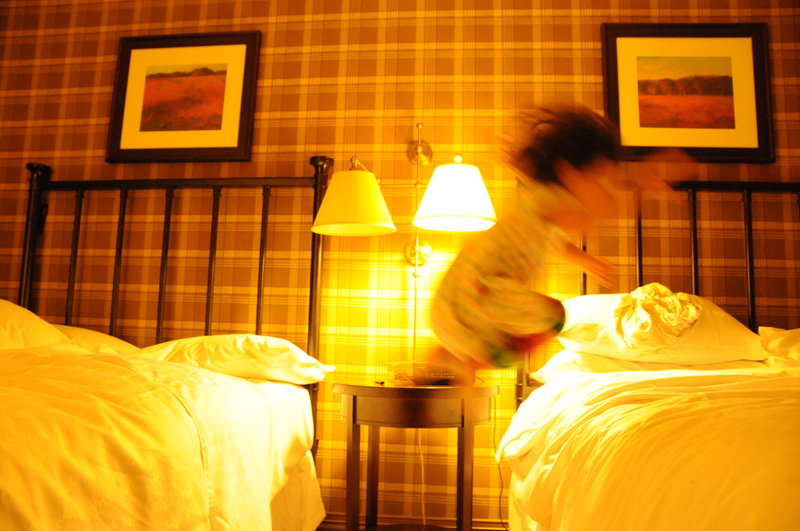 Mishy jumping from bed to bed in our Toronto hotel. I am sitting in a hotel room in Montreal while my husband and daughter are fast asleep. It is 1:13AM and I am thinking – what I am doing with my life? We’ve been in Canada, where my current citizenship is, for almost five days now. It feels like I have been on this trip for longer. We first stopped off in Toronto to see my family – my mother, father, oldest sister and her long time boyfriend. My father is going through a transition, having recently sold his business. He is in between jobs. Though he is past the age of retirement, he will never retire and has another job lined up. My sister, who is an actuary, told me most retirees get depressed after six months of retirement. My father will never get depressed. At least not from retiring. He has a need to keep the American Dream alive. Sometimes I wonder how my life would have been if we stayed in Korea. Of course, nothing is a better life without my daughter – yet, I do think about choices we make and choices we had no control over or say. My first memory is of me waking up in the middle of the night. It is our first night in Toronto and I cannot sleep. I remember my uncle’s brown sofa and how ugly I think it is. Where’s the color? I wake my oldest sister up because I want to go back home. She tells me we are home and it doesn’t make sense. I stare at the brown sofa for what feels like a long time while I hear my sister progressively breathing deeper. I just want to go back home. That was my first heartbreak. I don’t know if we ever get over our first heartbreak? Maybe through tears? Over and over again? Mishy with my oldest sister, the actuary. My sister and my daughter adore each other. My daughter couldn’t stop holding her hand or wanting my sister to carry her or kiss my sister or tell her to give her airplane rides or jump on the bed with my sister. We had two double beds in our hotel room in Toronto and my daughter instantly made up the game of jumping from one to another. They were spaced over two feet apart. My husband likes to call my daughter a dare-devil. To me, she’s a toddler. 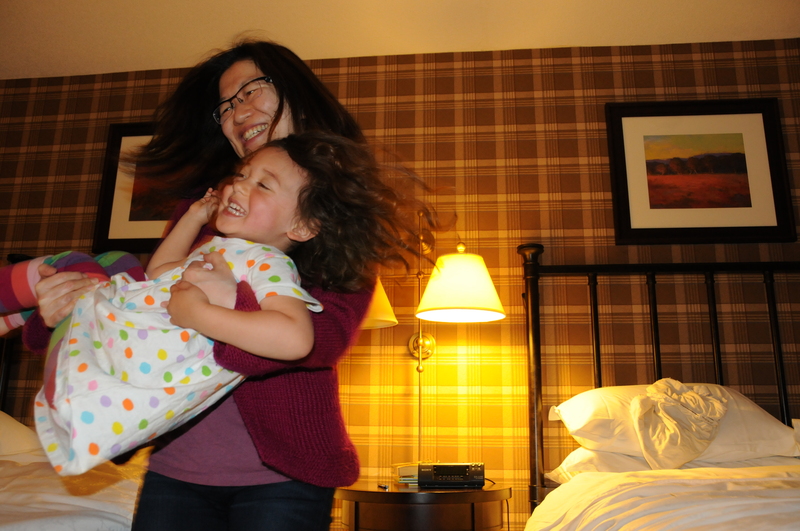 My daughter showed my sister how to jump from bed to bed – by balancing on one end and then jumping and rolling. My sister remarked how much weight my daughter must have on her head because of the way she rolled on the bed, while I was watching closely to make sure she was safe – the differences in observations an aunt makes as opposed to a mother. My sister doesn’t have any children of her own right now. She has already done her share in raising them – me and my middle sister. We live 3000 miles away. It’s hard for family to be so far apart. I know. I always wished for family – a large extended family who would relieve my mother’s burden of caring for three young children only 2.5 years apart. In Montreal, I am not a part of my husband’s family. Despite being with him for 14 years, they do not know me and I do not know them. Maybe like family, we don’t really like each other. They put up with me because I married their son, grandson, nephew, cousin, etc. and now I am the mother of their great-granddaughter, granddaughter and I put up with them because they brought my husband into this world, or helped raise him, or grew up with him. While everyone talked, I was alone. There were 34 people at dinner and aside from playing with my daughter, I spent most of my time talking to a stranger I had just met, a family friend who was interested in finding a place to stay while she visited Santa Monica in the summer. I wish I could give the gift of a larger family to my daughter for longer periods of time. I wish I could start trusting my mother-in-law again. Prior to me becoming pregnant, we were very close and then I became pregnant and things changed. After I gave birth, a lot of things were said and done and it made me believe the person I had known before was false and only befriended me because she was scared she was going to lose her son. A psychiatrist told me my mother-in-law has deep issues which will never be resolved because she does not want to investigate. A mediator told me she is in a place of pain and while forgiveness is not the answer, acceptance is. Do I accept my mother-in-law for all her faults and her inability to take any sort of responsibility? Clearly, I am not in an emotional place to accept right now. Maybe it’s because I have the thought in my head that she secretly wants to destroy my marriage so she can have her son back. She has a history of having family members take sides and during the first two years of my daughter’s life – she made it very clear she was on a focused desire to turn his family against me one by one. That is my opinion. To many times I remember coming home to my husband in a yelling match with yet another relative in the early months of our daughter’s life. So here I am with a daughter I adore and a husband who loves me and an older sister who is loving to my daughter and whom my daughter adores. Perhaps that is what I will focus on and everything else will fall into place – including what am I doing with my life? Or maybe the question is – what will I do with my life? Now that my daughter is getting older and needs me less – needs me in the sense of the first three years when she needed me every second. Now, she plays by herself and motherhood has become, well, less exhausting. Maybe it’s time for me to return to my writing. My creative writing of plays and screenplays and make a mark for myself outside of motherhood. There – I am declaring it to the world – I am going to return to writing – not just writing on the blog – but writing to explore, to let go and live – in a different way that is so fun and freeing and sometimes so hard to start. Just begin. Just begin. Just begin. 5% of your purchase goes to Santa Monica Alternative (K 8) or another school of your choice. The coupons work for the first 1000 new buyers to Mamapedia and the offer lasts for the next five days. I started this blog to share – to share my experiences as a new mom and to provide a document to my daughter so she knows what her life was like in her early years. There is also a part of me that is slightly morbid – or perhaps a planner – this blog was an insurance of sorts – just in case something were to happen to me – so she knows how much I love her. Maybe this has to do with my memory of my mother gathering the three girls around her and asking us, “How would you feel if I died?” Yes, my mother asked us this over and over again throughout our years of living under her roof. Maybe she didn’t feel appreciated and needed to express this in a dramatic way. My first memory of her asking us is of me crying. Over the years, our answers changed until I remember my sister saying and honestly, me feeling this – “We’ll survive.” I certainly hope I don’t ask Mishy – “How would you feel if I died?” I just hope she knows I love her dearly and truly love being with her and really am thankful I get to be her mother… and in the back of my mind, if anything were to happen to me, she has this to read to know we had fun together. The next couple of weeks will be a catch up of sorts – I still took photographs to document our adventures so there might be a flurry of posts. Please forgive this and for subscribers, you are welcome to delete any posts you feel are obsolete. Thank you for joining us on this journey of new motherhood. It’s official. There is no turning back. We leave tomorrow. We have packed, cleaned, and stored. Our place is being subletted while we are gone. We are bringing our cat, Kitty, various stuffed animals, books, and the basics we need to survive – except food, which we can easily buy. Here is an excerpt and link to what we will be doing in NYC. I will be returning to acting after an almost three year break. Eek! “THE BILBAO EFFECT — a world-premiere play that puts contemporary architecture on trial — written by Oren Safdie(whose previous play about architecture, PRIVATE JOKES, PUBLIC PLACES, was a hit Off-Broadway in 2003) will be presented Off-Broadway with previews starting May 12 prior to an official press opening night on May 16, 2010 at Center for Architecture (536 LaGuardia Place) in Manhattan. PRIVATE JOKES, PUBLIC PLACES, which was also presented at the Center for Architecture, starred Anthony Rapp. Mr. Safdie’s most recent play Off-Broadway, THE LAST WORD, enjoyed critical and popular success, and starred the Emmy Award-winning actor Daniel J. Travanti and Adam Green in 2007. “The Bilbao Effect” became a popular term after Frank Gehry built the Guggenheim Museum in Spain, transforming the poor industrial port city of Bilbao into a must-see tourist destination. Its success spurred other cities into hiring famous architects and giving them carte blanche to design even more spectacular buildings in hopes that the formula could be repeated. In Mr. Safdie’s play THE BILBAO EFFECT — the second play of a planned trilogy focusing on contemporary architecture — Erhardt Shlaminger is a world famous architect who faces censure by the American Institute of Architects, following accusations that his urban redevelopment project for Staten Island has led to a woman’s suicide. The play tackles controversial urban design issues that New Yorkers have recently encountered in Brooklyn as a result of the hotly-debated plans to redevelop the Atlantic Yards into an architecture-star mega-development. THE BILBAO EFFECT explores whether architecture has become more of an art than a profession, and at what point the ethics of one field violate the principles of the other. Directed by Brendan Hughes, THE BILBAO EFFECT will be presented by the Center for Architecture in association with Jacqueline Bridgeman, Fritz Michel and Les Gutman. The play was commissioned by the Canada Council for the Arts, is supported by the Quebec Government Office – New York, and was developed through a column Mr. Safdie wrote for Metropolis Magazine.